You will notice that in this post we are sharing a conversation between Dr. Mom and her daughter, who is a parent herself. We hope you enjoy her real life parenting experiences. Let me begin by saying that throughout this post I will be referring to moms and dads, but what I say will also be true for other adult males or females that are important in a child’s life -grandparents, uncles, aunts, etc. BECAUSE I’M YOUR DAD shows us in many delightful ways that daddies play differently than mommies do. Dads are more active, more physical, and use bigger muscles than moms do. Dads bounce, lift, and tumble with the kids more than moms do. Kids can tell these differences between dad-play and mom-play, and they love it when dad is their playmate. Mommies have special ways to play and be with their kids too. Moms are softer and more cuddly. They talk more and play with toys and games more. 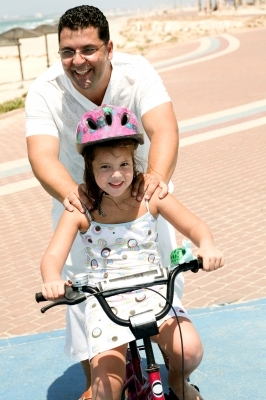 Kids can feel the difference between Dad’s big, quick movements and Mom’s smaller, slower movements. They love Mom’s type of play and need this calmer, more soothing play along with bigger, louder, stronger dad-play. The important parenting thought here is that kids need both types of play. 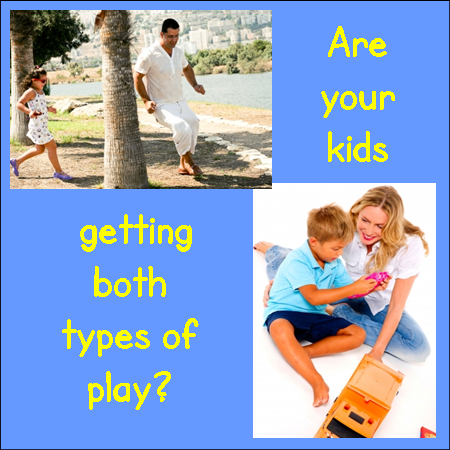 The kids learn something different from each type of play. They need the variety. If one type is not part of their lives, they know it, and they miss it. I have to agree that kids need both types of play. But, sometimes mommies are the ones rolling around making kiddie blanket burritos or building mud forts. (Or more likely snow forts – they are cleaner!) Sometimes this is just an issue of personality or personal preference about ways to play, but sometimes (as was my case while daddy was out at sea) mommies have to do both jobs. We have to learn to play both ways. You might feel awkward at first, but when you see your child’s reaction to the big muscle play and how much fun they have, you quickly relax into the new way to play. Top image courtesy of imagerymajestic/FreeDigitalPhoto.net. Bottom image courtesy of ambro/FreeDigitalPhotos.net. How a dad plays and talks to his daughter sets the stage for how she thinks about boys and men as a “tweener,” teenager, and young woman. The relationship that is formed with Dad will shape what a daughter expects of boys as she grows up and the kind of relationships she will have with boys and later with men. It is as though anything Dad says about what is wrong with her or what is great about her is being shouted from a mountaintop – it’s bigger and louder than other things she might hear. Sometimes bigger and louder than Dad ever thought it was or that he meant it to be. A dad can make an off-hand comment, thinking nothing of it and not even remembering it later. But, a child could remember it forever. That’s why it is important for dads to realize how important they are in their daughters’ lives. I once heard a person describe this as, “It is as though the daughter has swallowed her father whole.” Everything he has said about her through words or actions – how she looks, what she has done or hasn’t done, what her talents are – becomes so much a part of her that she can’t tell the difference between her own view of herself and his view of her. Another way this can be described is this. It is as though every time she is with her dad he is holding up a mirror for her to see herself. She sees herself through his eyes and that view becomes so much a part of her that she doesn’t even realize where her beliefs about herself came from. She just knows they are part of her “bone knowledge” (read about bone knowledge). I have to agree. I can definitely see in our house that what Dad says sinks in a little deeper. I tend to use this to my advantage – if I need to get a point across, I’ll make sure Dad delivers the message. What I don’t always think about – and should – is the other times Dad communicates with E. (either by saying something or by not saying something). I’m sure he doesn’t attend to the messages he is sending, but as we enter “tweendom” we both need to be vigilant about editing our messages. We both have editing to do but in different areas. My editing needs to be focused on more balanced love (read more about balanced love). I probably tend to be a little heavy on the “love you no matter what” side of the teeter-totter and need to add in more on the “you can learn to do for yourself” side. Hubby on the other hand needs to be more proactive about engaging in her life. He has a job that requires late hours so he sees her in the morning before school but sometimes does not see her at the end of the day (and he works all day Saturdays). So, he misses things and doesn’t always think to check in with E. about how things went, how they are going, or what’s coming up. He relies on me to catch him up at the end of the day. Now, I must say something about the soft side of daddies too, because children need to see and feel tenderness from their dads as well as from their moms. A lot of the daddy behavior in BECAUSE I’M YOUR DAD is about soft and loving behaviors – carrying, missing, kissing, etc. It reminds us that daddies can cuddle and offer a child love, affection, and comfort just like moms do. Children seem to want this from their dads as well as their moms. You may have noticed that when a child is very young (less than two) and upset, he seems to prefer his mom for comfort. However, as a child gets older, this preference goes away unless Mom and Dad have made it clear that only Mom offers that kind of comfort. Just like with playtime, a child is likely to feel the difference between Mom’s and Dad’s hugs. Being surrounded by big strong muscles and being held pretty tightly is different than being snuggled into soft arms that gently sway back and forth. But, it is important to kids that daddies can kiss and cry, cook and soothe, and bandage an ouch. It is important that they can give a bath, change a diaper, and rock to sleep. Lucky for the kids, many more dads are doing all of these things. Let’s think for a minute how great that is for kids. If only moms comforted children, they would have half as much comfort in their lives. With dads joining in, kids get twice as much loving. I will say that this is something hubby is good at! E. loves to snuggle on the couch with him while we watch a movie or some TV on an evening when he is home or a Sunday afternoon. I have hope that as she gets older she will not come to me for comfort all the time, but I think we have a longer road to get to that point. With Dad being gone for 2 years at a time when she was younger E. is still learning to trust him and go to him for help. But, that is a whole huge topic for another day (or two or three or ten). As far as daddies kissing, crying, cooking, soothing, and bandaging ouches – I totally agree! Hubby has got most of that covered – he bandages ouches, soothes, and definitely cooks, but the only crying he does is when he is cooking onions. The funny thing is that when E. was little (1st year of her life) hubby was the one that figured out how to calm and soothe her. He would just rub her little head and she would calm right down. He was like the baby whisperer. Even when I tried the same motion in the same place on her head, it would not work nearly as well as if he were there doing it. Even at that young age E. could tell the difference between Mom & Dad (and she liked Dad best). Dads act like their dads acted with them – especially when dads are under pressure. This works very well when Dad’s dad was good with his kids and understood his kids. If this was not the case, and Dad’s dad was too harsh, too rigid, not careful about setting rules and sticking to them, overindulgent, or not caring enough, then Dad can have a difficult time being a dad himself. Will he be like his dad or will he become his own type of dad? See our conversation about “Parenting Road” for help deciding what kind of dad (or mom) you want to be. It is quite possible for a dad to be the dad he wants to be. He can think about what he experienced himself and decide what parts he wants to keep and what parts he wants to set aside. He can learn about kids and understand them better than his dad may have understood him. So, although it can be true that dads act with their kids like their dads acted with them, it doesn’t have to be always or forever true. It can be true only if that is the way a dad wants it to be. Each dad can decide what he will be like with his kids. Use our “Daily Parenting Tips” to get started making those decisions.